Value pack-12 funny wind up toys included. Lovely skeleton and mummy shapes meet your different taste. Wind Up and Go-just rotate the clockwork spring. Wind up skelrton and mummy toys will keep walking for a while. Not horrific but very lovely. package includes 12 funny wind up toys with shape of lovely skeletons and mummys. Different cartoons figures and colors meet you different taste. Just rotate the handle and toys will start hopping and walking. Suitable for kids 3 year and up. Very interesting! Less and less people play clockwork toys now, but I think it's interesting and fun, it's the memory of my kids time, and I hope my kid can enjoy it too. Great products. Bought a lot of this as party favors. 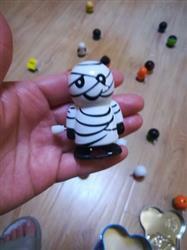 On Halloween'eve, we had a great costume party in our neighborhood, kids liked this mummy toys very much. exquisitely made, I love this mummy ! Great toy. The child plays the whole evening. Great toy. The child plays the whole evening. On a full charge rolls about 3 meters and 3-4 full transformations. The plant is not too tight, but tangible. The mechanism seems reliable. As a gift the seller put a cute key chain.